Not only did the Minnesota Department of Administration extend the annual contract to supply vital records certificate paper for the State of Minnesota, it added a new foil hologram to improve the security of each vital records certificate. Minnesota’s security paper contract is with AmeriTech Inc. who subcontracts the printing to the Brooklyn Park-based Northstar. Last year, the state’s long-time paper vendor closed shop without notice. The closure left the Office of Vital Records (OVR) along with many county vital records offices short on paper. Through creative problem solving, OVR and county offices collaborated to assure minimal impact to service delivery and no interruption in printing certificates. That, along with an emergency paper printing run provided by Northstar, helped the Minnesota vital records system avoid a paper shortage crisis. Northstar prints Minnesota’s paper using an off-set printing method which produces an authentic, smooth document. Intaglio printing, which had been used by the previous vendor, produced an engraved, raised border and state seal. With advances in copier technology, OVR received reports that color copies of certificates did not always show the void watermark and were hard to distinguish from original certificates. Feedback from counties and others about photocopied certificates, and the loss of what many thought was a raised or embossed seal, prompted OVR to consider incorporating other overt security features when the time came to renew the contract. OVR asked Northstar to design a secure holographic foil stamp for the certificate paper. The foil feature doesn’t show on color copies of original certificates so aids in visual authentication. In June, at the Minnesota Association of County Recorders Annual Meeting in New Ulm, OVR shared a prototype design that put the new foil stamp in the shape of Minnesota in the lower right seal. County vital records staff at the conference voiced approval of the three-dimensional graphic and confirmed that the new secure foil would meet their needs. The state added the holographic foil as a contract specification and will require the security feature on all new paper. Northstar will continue to fulfill orders for security paper until the current stock (without the foil) is depleted. 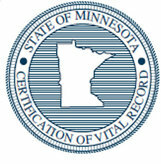 Counties can continue to issue certificates on the vital record paper they have in stock. When Northstar prints new stock, the holographic foil will be imbedded in the document. OVR expects foil paper to ship in late October or early November depending on how quickly the existing supply is exhausted. With the new holographic foil, the cost for security paper will increase slightly—about 1.5 cents per sheet. OVR will inform county vital records offices as the existing paper supply draws down. Northstar will work closely with OVR to communicate when the foil paper will begin shipping so that purchase orders being placed by county offices are priced correctly. Look for email communications and updates on the Minnesota Department of Health Information for Local Issuance Offices website. Because there is no population-based health status indicator available below the county level for all communities nationwide, it is difficult to identify health disparities across communities or to measure progress in eliminating health disparities. For that reason, the Robert Wood Johnson Foundation, the National Association of Public Health Statistics and Information Systems (NAPHSIS), the National Center for Health Statistics (NCHS), and the Office of Vital Records (OVR) along with other jurisdictions, are participating in the Census Tract Life Expectancy Project. The Project will calculate a single summary indicator of health status, estimated life expectancy at birth, for every community at the census tract level nationwide. Life expectancy reflects the underlying causes of mortality including the social, economic, and environmental conditions that result in the most serious illnesses and injuries that most often result in death. It summarizes the mortality pattern that prevails across all age groups - children and adolescents, adults and the elderly. Life expectancy is calculated using mortality data registered with each death record and is collected by vital records offices in each state and territory, including Minnesota, as well as population counts and estimates from the Bureau of the Census. The project is piloting the use of census tracts rather than ZIP codes because federal agencies are interested in sub-county level data on health and, census tracts are more stable groupings. ZIP codes can cross county lines, are not tied directly to census population counts and change more frequently, so they are less accurate and stable. OVR sends information about every death that occurs in Minnesota to NCHS each day in an electronic file. For the project, OVR resubmitted death information and included an additional data element, the decedent’s residence address, for death records filed from 2010 to 2015. This public data is key for geocoding and for calculating census tract life expectancy. OVR will receive geocodes (latitude-longitude and census tract) for each death that occurred in Minnesota between the years 2010 through 2015. The geocodes can be used for public health purposes and to evaluate existing geocodes prepared by other sources. Through this project, the Minnesota Department of Health (MDH) will have access to census tract life expectancy estimates for Minnesota; another tool to measure health outcomes at the community/neighborhood level and identify health disparities. The project will also consider sustainability and how to accomplish updates to life expectancy at birth by census tract. NCHS is expected to release the life expectancy at birth estimates in February 2017. OVR will share information about the project in the spring. All users who have the ‘birth registrar’ role in MR&C will receive a short survey from the Office of Vital Records (OVR) this month as part of the Beginnings and Beyond Engagement (BABE) project. The survey questions are intended to give the BABE project an overview of who collects the non-medical information from the mother, on what form and what actions are taken if data fields are left blank. OVR needs and values your participation! The BABE project is taking an in-depth look at the collection and use of four data items reported by a mother during the birth registration process. The mother is asked to report her education level, race, ethnicity and cigarette use (before and during pregnancy) by providing the information usually on a worksheet. The worksheet is also used to collect other information from the mother including her marital status, parent’s names, birthplaces, and the baby’s name. Hospital birth registrars take information from the worksheet to create a birth record in MR&C. “Unknown” answers to mothers’ education level, race, ethnicity and cigarette use have been increasing in recent years. The BABE Project is exploring why these data elements are not completed. OVR invited hospitals to partner with OVR in this project. OVR selected Regions Hospital in St. Paul and St. John’s Hospital in Maplewood and are working with staff to take an in-depth look at how those facilities register their births. OVR staff and staff from both hospitals have had meetings to explore birth registration processes, birth record data collection tools, and how birth registrars and labor and delivery nurses work together to register births. Hospital staff explained the challenges they face in collecting birth record data and the changes they’ve made that have helped them to be more successful in collecting that data. OVR even got a first-hand look at birth registration by shadowing birth registrars at these hospitals for part of a day. OVR plans to use findings from the BABE project to revise and pilot a new mother's worksheet, make recommendations for process improvements, highlight best practices, inform training and set outreach priorities. Decedent’s residence information is used by the Minnesota Center for Health Statistics to compute death rates by county. The same information will soon be used to calculate estimated life expectancy at birth for individual census tracts in Minnesota. Did you know that the decedent's residence information is collected on the death record in the Minnesota Registration & Certification System (MR&C)? The residence is the physical location of the place where the decedent lived and is not necessarily the same as the mailing or postal address, especially in Greater Minnesota. MR&C data fields conform to the U. S. Standard Certificate of Death data set (with the exception of some Minnesota-specific data items). MR&C lists the cities, towns and townships within counties. When registering the fact of death make sure the residence county is correct. MR&C requires the county to be selected first. If you cannot find the city after selecting the name of the county, the informant may have given you the address where the decedent received mail rather than the address where the decedent lived. Ask the informant for the building number, the street name and the township for the residence address. More information about the decedent's residence information and other data items collected during the death registration process may be found on the Centers for Disease Control and Prevention website Funeral Directors’ Handbook on Death Registration and Fetal Death Reporting. September 12-14, 2016, National Association of Public Health Statistics and Information Systems (NAPHSIS) Regional Meeting in Rapid City, SD. September 20, 2016, Cause of Death Training at Allina Health United Hospital in St. Paul. September 28, 2016, Cause of Death Training at Hennepin County Medical Center - Academic Conference. September 13 - October 5, 2016: Office of Vital Records on agenda at Minnesota Funeral Directors Association Regional Meetings.